Dr. Djimé Adoum has begun his second term as head of CILSS. The organisation's governing bodies renewed his mandate for the next three years during their meeting from 27 to 30 June in Ouagadougou. CILSS has undergone significant transformations since Adoum took up the position in 2013. It has grown from nine to 13 members and has earned the trust of development banks (World Bank, AfDB, etc. ), which have entrusted to CILSS the implementation of flagship projects such as the Regional Sahel Pastoralism Support Project (PRAPS) and the Programme to build resilience to food and nutrition insecurity in the Sahel (P2RS). "CILSS must adapt and address problems through the promotion and popularisation of scientific knowledge among the population, taking into account the concerns of member countries and openness to other prospects for innovative funding," he said in 2013. These major concerns remain relevant in 2016. 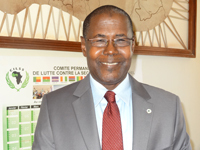 Appointed in the Office of the President in 2009, he first served as a technical advisor on rural development to His Excellency Idriss Deby Itno, President of Chad, before being named minister in late 2011. With some 25 years experience in international development, especially in sub-Saharan Africa, Dr. Adoum has held many positions of responsibility in the field of agricultural research, agricultural extension and the design of development programmes covering a large number of countries (Cameroon, Chad, Egypt, Ethiopia, Senegal, South Africa, USA, etc.). By working for various international development partners (World Bank, USAID, research institutes, etc. ), he has acquired extensive experience and knowledge in the implementation of development strategies. Mr. Adoum holds a graduate degree in agronomy, focusing on crop production and statistics, and a PhD in agronomy and agricultural extension from the University of Maryland, USA.